We are saddle and boot fitting specialists and can help you choose the perfect saddle or boots. 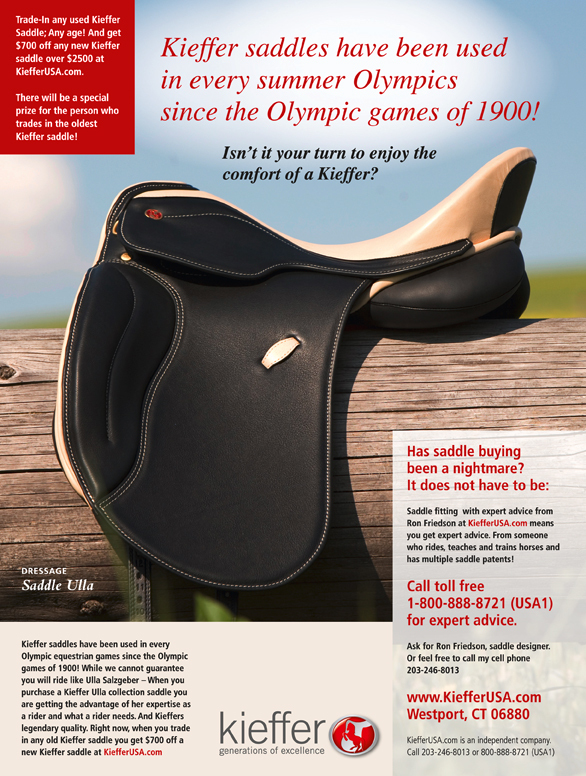 When you are ready, please contact us at 1-800-888-8721 or info@kiefferusa.com and we can go over the details to get you the right saddle. As always, you get two years free tree adjustments and our 30 day ride and try policy!!! If you don't see what you need, or are not sure: Please call me on my cell phone 203-246-8013. Ron Friedson, Saddle and Boot designer! Email us at info@kiefferusa.com We repair and adjust Kieffer and all better brands of saddles. Kieffer saddles and tack are made by Kieffer of Germany by Master Craftsman. KiefferUSA.com is an independent company and is not in any way owned, or operated by Kieffer of Germany. KiefferUSA.com serves the riding public of the USA only. KiefferUSA.com is owned by a Master Saddle Designer who himself is an accomplished equestrian with more than 45 years of experience. He is an expert on the unique requirements of the North American rider. Prices, specifications and availability subject to change without notice.